Ice skating carnivals had been successfully held at Airthrey Loch for several years in aid of charity before the accidental death of two skaters there in 1901. These carnivals had involved many skaters in fancy dress costumes and various lighting effects around the loch. Lanterns were also sold for the skaters to hold while moving round the ice. This type of carnival was repeated at Raploch and organised by the Town Council. The first ice carnival took place on Saturday evening, 1st February 1902. Admission charges were, Adults 1/-, Juveniles 6d, lanterns for sale at 3d. 8th February, 1902, Bridge of Allan Reporter. The continued frost led to another carnival on Wednesday evening 12th February. The lighting was repeated and this time an absence of wind and a keen frost made for perfect conditions. Between six and seven hundred were admitted this time and different costumes were noted by the newspapers. As before Stirling Brass Band played music and Messrs Keith & Ralston were the purveyors, drawing £32: 5/-, expenses £12. 15th February, 1902, Stirling Observer, County Edition and 14th February 1902, Stirling Journal. On Friday evening 19th February another carnival took place at the skating pond and in order to give the working population an opportunity of participating in the skating, the prices were lowered by half from those previously charged to 6d for an adult and 3d for a juvenile with 50/- given to the band for their efforts. ‘There was a very large turnout of spectators outside the fence and also of skaters and others inside. Although the ice was somewhat rough it did not lessen the enjoyment of skaters and onlookers. There were a great many excellent costumes worn and a considerable number were new from previous carnivals. Owing to the reduction in charges of admission, about 1300 people, most of whom wore fancy costume of some kind took part in the proceedings. 22nd February 1902, Stirling Observer County Edition. It is not reported how the purveyor supplied the tea and coffee at the skating pond, but it must have influenced the decision for a refreshment room to be built at the pond. 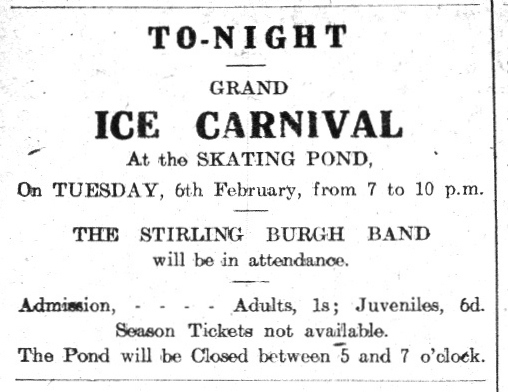 11th March 1902, Stirling Council minutes No:507, Skating Pond – Ice Carnivals, income and expenditure submitted and recorded as abstract. On 14th January 1903, the Burgh Committee Meeting agreed to an Ice Carnival on Friday 16th January, 6pm to 10pm, admission 6d per person. It was agreed to light the pond with paraffin flare lamps only. The Master of Works was instructed to hire a supply of close glazed lanterns to be used if required. The poor lighting would not be repeated. On 17th November 1909, the Burgh Committee Meeting agreed an Ice Carnival on the Friday evening if frost held. Master of Works was instructed to take offers for lamps and decorations. The hours to be 7pm – 10pm, pond cleared of skaters and swept from 5pm to 7pm. Band to play from 7pm to 8pm, bandsmen provided with tea, otherwise their services being provided free. 24th November 1909, Stirling Observer. 8th December 1909, Burgh committee meeting minute No 207, Skating Pond. Tuesday 6th February 1912 advert in Stirling Observer. It seemed that some people preferred ice skating to roller skating as a drop in attendances at the roller rink was reported for as long as the ice held good for ice skating. There may also have been some reciprocal effect, however, with the newly opened roller skating rink causing a lower attendance at the ice carnival than in previous years. The loss shown on the 19th November was exaggerated by the use of additional lighting which was the largest expense of the night. The preparations for the carnival necessitated the clearing and cleaning of the ice and the carting to and from the ice of the lighting used. The carnival was advertised by the distribution of bills posted throughout the town and an advert in the newspapers. The 6th February 1912 carnival did not take place due to a thaw and there was a letter of complaint in the 13th February, 1912, Stirling Observer. The Town Council simply took too long to decide to have one and there was a loss of at least £4: 17s 6d as a result of the cancellation. The lost opportunity to participate in a carnival would be more keenly felt with the demise of roller skating the previous year. During the longest spell of skating of any winter there was still no carnival. On 2nd December 1925 the Town Council meeting agreed not to have an ice carnival in the meantime. It was suggested that the Burgh Band might play at the skating pond on Saturday evening instead if the frost continued. It was reported on 6th January 1936 at the Parks Committee meeting that they had arranged for a carnival on Christmas Day, but owing to a thaw it was postponed. This was the last time it would be considered.